How cool that you know Angela?! 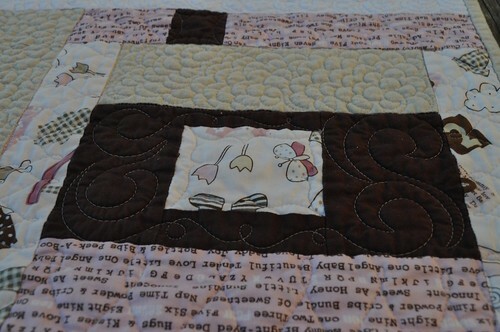 I pull up the photos of her quilts when they show up in blogland to look at the details. I would love to pop over to her studio just to watch for an hour! Beautiful work AND very creative work - I have enjoyed following her quilting. Wow, this is a great give-away! I have plenty of quilt tops I could give Angela to finish for me. Thanks for the chance! so cool! I how you are recapping each year! It's been quite the journey! thanks for such a generous giveaway! angela's quilting is amazing. How nice of Angela! I was just thinking that I might ask her for an estimate to quilt a special Halloween Quilt for me...$25 credit would be so nice! Congratulations on five years of blogging, Vicki! Oooh...Angela's work really is amazing! It'd be a dream to hire her services! 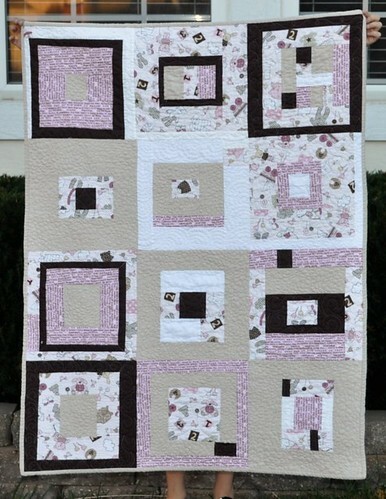 This is such a great give-away -- I've been drooling over Angela's quilting for a while now. Also, I really do love your blog; I'm "starting" (i.e. planning & choosing fabrics for) my first quilt, so it's great to see what others are doing. Happy 5th Blogiversary! I love the quilting on this quilt. 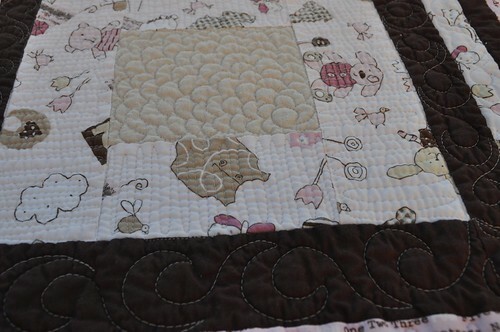 I am going to try the long loopy style on this really cute quilt I am finishing for a friend. Thanks for all of the posts these past five years. I have only been following you for the past year but find you really inspiring. Congrats on your 5 year anniversary. That quilt is so cute. Thanks for the great giveaway. Yay for 5 years! I'm not sure how I found your blog, but it's been in my reader for a while now and I've really enjoyed it. Thanks for the chance at your giveaway! Good luck to everyone. Happy blogiversary! Keep up the creative work and here's to another 5 years! Cheers! Would love to win Angela's quilting! Yup, this is a great way to celebrate - the recaps are so fun! And that charity quilt is LOVELY! I've only done straight line quilting so this is a great giveaway! Angela's quilting is amazing! This ia a fun recap. I have a quilt in the works that would really benefit from professional quilting ... Let me be lucky !! Thanks for this chance to win ! This would be FABULOUS to win . She does very nice work ! Who can say no to even the possibility of free quilting?? Congratulations. oh, that's a great giveaway!! what a cool quilt. This would be so nice to win and use. Thank you both!